For the second time, the 1st Choice Street Team will be present in different cities of Quebec to make all lives a great experience. The ultimate goal is to prove that this Quebec brand allows owners of cats and dogs to give health to their companion in the form of tasty kibbles. Of course, the Street Team may not be defined only as an educational component, but is also there to entertain people who come to meet it in different participant pet shops and dog parks. As we want to offer a constantly improved experience, our 1st Choice Street Team innovates this year with the visit of over 20 dog parks across Quebec. 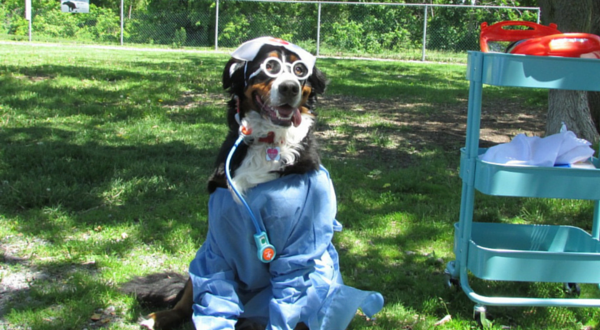 Without giving you all our surprises, consumers will disguise their dog in health expert with the help of our 1st Choice representative and have their picture taken. A beautiful contest is attached to this activity. In addition to health advices it lavish pet owners, the Street Team will use its presence to hand out surprise gifts to those present. This is not all! Until the end of August, the 1st Choice Street Team will visit several summer events and some specialty stores. A fun activity will be carried forward in order to please young and old. All of our participating retailers know that daily use of 1st Choice foods help prevent several problems such as allergies, weight gain, etc. Join the 1st Choice Street Team this summer so that we fight all the problems of your pet together. Today, give your pet the best health possible. Stay tuned for the 1st Choice Street Team schedule throughout the summer on the official 1st Choice Canada Facebook page.